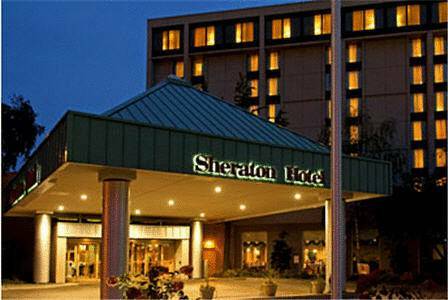 Propel your travel experience when you book a stay at Sheraton Cleveland Airport Hotel. From the moment you depart Cleveland Hopkins International Airport in our complimentary shuttle, you'll be enamored by our superior service and thoughtful amenities. Upon arrival, stop by Hemispheres, our hotel's on-site restaurant, and refuel with tantalizing international cuisine prepared with fresh, farm-to-table ingredients. Adjourn to your spacious room, where you can drift away to relaxation by plunging into our plush bedding and watching your favorite shows on our flat-panel TVs. If business brings you and your colleagues to Cleveland, Ohio, host a collaborative conference in one of our modern event venues boasting AV equipment and customizable catering menus. Prepare your presentation while our team of professional planners handles all the details of your seminar. Whether you're in town for a long weekend or extended visit, let Sheraton Cleveland Airport Hotel foster your soaring ambitions. Hemispheres: After landing at Cleveland Hopkins International Airport, take off to Hemispheres to indulge in international cuisine prepared with farm-to-table ingredients. Our hotel's restaurant offers an inviting dining atmosphere for the modern traveler.